Welcome to Paradise! Our luxurious and intimate Inn offers the perfect combination - the ambiance and amenities you deserve for a quiet, romantic vacation on the beach and lots of exciting excursions nearby for the adventurer. 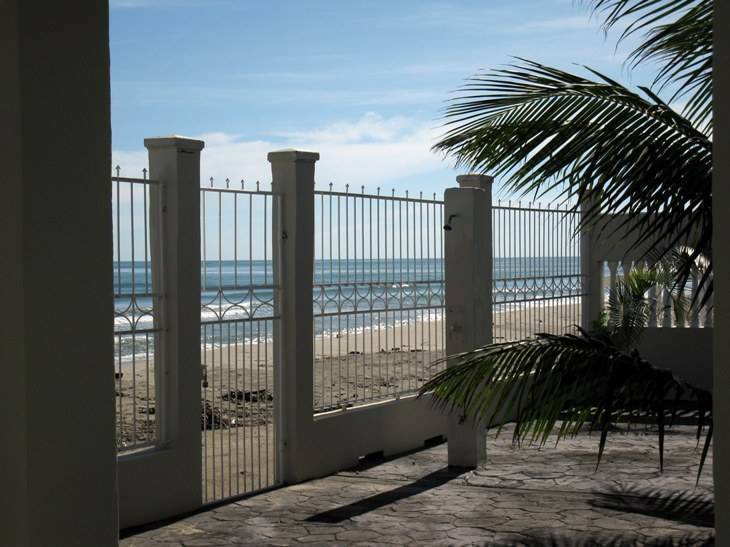 We are located 15 minutes East of La Ceiba, on one of the most beautiful beaches in Honduras, Playa Helen. Drift off to sleep every evening listening to the Carribean ocean waves breaking just a short distance from your room, or gazing at the beautiful mountains. We know that a stay with us will leave you with a desire to return... soon! The major city to fly into is San Pedro Sula (SAP) Continental, Delta, American, TACA & Spirit are the major airlines. 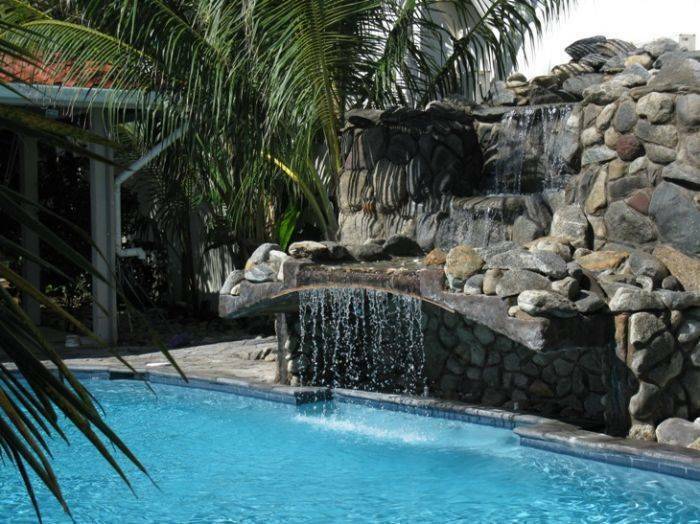 From here you will either fly to La Ceiba, via Islena, Sosa or Atlantic airlines, or we can make arrangements for a van to pick you up at the San Pedro Sula Airport. Ferry ride to Utila or Roatan, the Bay Islands with the second largest living reef in the world and famous for their snorkeling and skin diving. Boat pick up right on our beach to Cayos Cochinos, a small set of islands that are part of the Smithsonian Institute Marine Reserve for picnicking, snorkeling or fishing. A canopy tour through the tops of the trees in the Honduran jungle. White water rafting on the Congrejal river. 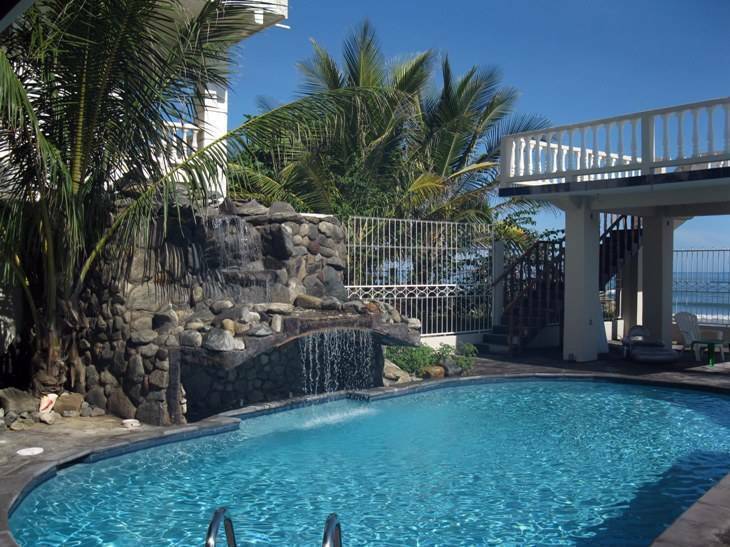 Simply relaxing on the beautiful white sand beach or pool side while sipping a pina colada. salt air & hear the waves breaking. Room #1: Ocean suite, queen-sized four-poster bed, air conditioning, ceiling fan, purified water, coffee pot with fresh Honduran coffee, television w/basic cable & dvd/vcr and private bath with shower and hot water. Room #2: Mountain suite with King bed (option of twins) air conditioning, ceiling fan, purified water, coffee pot with fresh Honduran coffee, television w/basic cable & dvd player and private bath with shower and hot water. Bungalow: Mountain view with double bed, air conditioning, ceiling fan, purified water, coffee pot w/ fresh Honduran coffee, television w/basic cable & vcr, private bath with shower & hot water and small kitchen. All rooms have first class linens, lock boxes & private entrances. 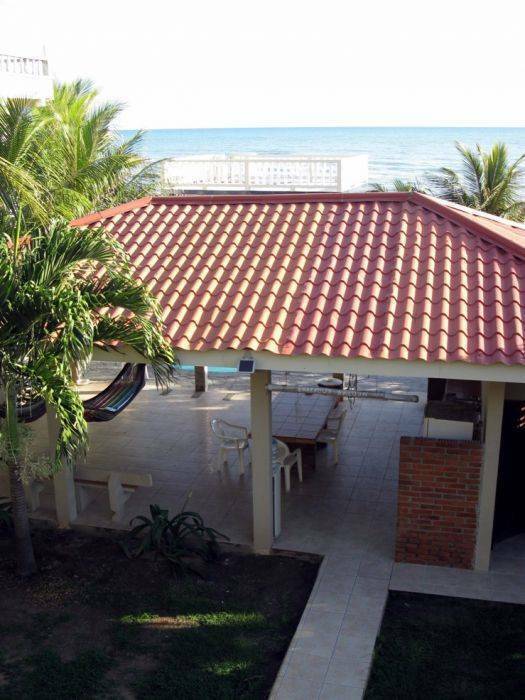 A few steps from each of the rooms is a Champa (Honduran entertainment area) with shower, bathroom, sink, refrigerator, bar-b-que, tiled table and chairs, ceiling fans and hammocks. 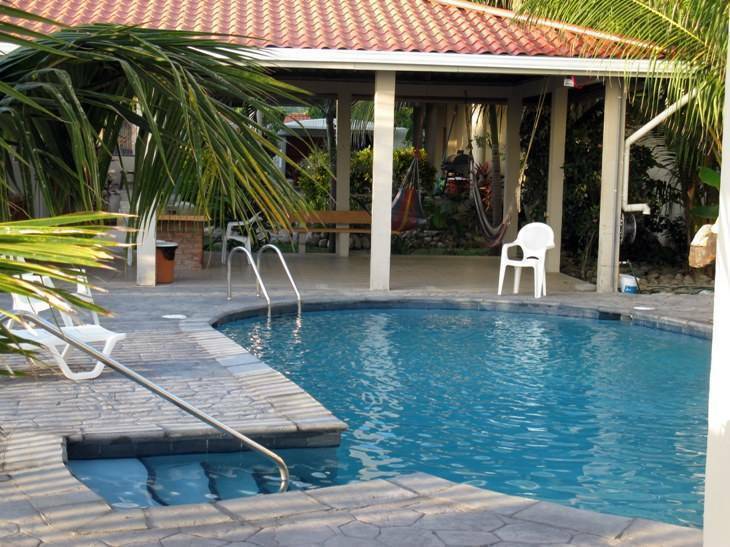 Pool side is the New Barefoot Saloon, with a great variety of tropical and mixed drinks. Travel barefoot around the world sampling the delicious appetizers and stuffed burgers. 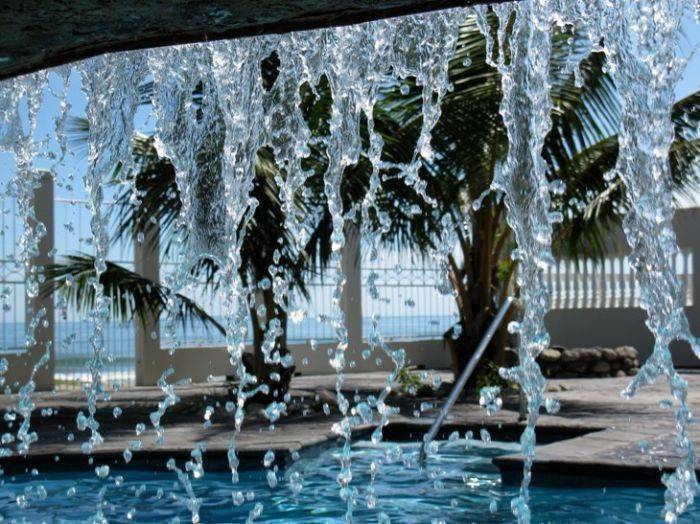 There is a shower as you step off of the beach and beach chairs and towels are provided. Breakfast and airport pick up and drop off available for additional charge. All rooms have private baths with shower, hot water, air conditioning with in room Coffee pot and purified water. Room #1, queen-sized four-poster bed, air conditioning, ceiling fan, purified water, coffee pot with fresh Honduran coffee, television with dvd and private bath with shower and hot water. All reservations require a 50% deposit. Reservations cancelled less than 30 days prior to arrival forfeit 50% of deposit. Reservations cancelled less than 7 days prior to arrival forfeit deposit. All refunds incur a 5% transaction fee. Deposits to be made via PayPal.